TsukuBlog | Onabake Jinja`s Hatsu-uma Festival Features a Lively Traditional Market (this year on March 23rd)- and an interesting history! 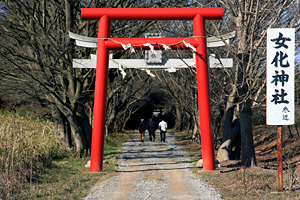 The worshipper`s path leading to the Onabake Jinja Shrine (pronounced ONA BAKEH). 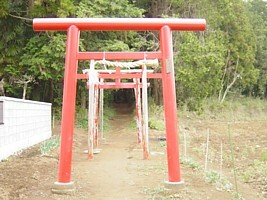 The vermillion torri gate indicates that it is an Inari Shrine, dedicated to Inari, the deity of rice, agriculture, food – and fertility in general (as well as of various other things!). 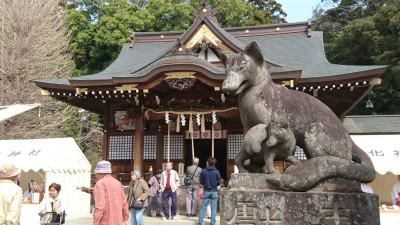 Inari`s messenger is a fox – and this particular Inari Shrine`s unusual name, “The Fox-Tranformed- into-a-Woman Shrine” derives from an interesting local legend that I have detailed below. The Onabake Shrine`s Hatsu uma festival and market on September 27, 2018. 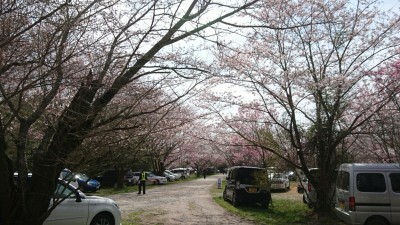 Luckily the weather was perfect and the cherry trees on the grounds had burst into bloom! 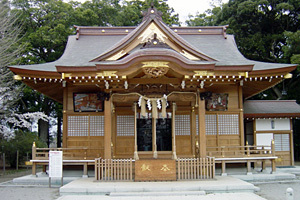 The Onabake Jinja (女化神社) Shrine in Ushiku (Tsukuba`s neighbor to the south) has three distinctive characteristics that make it a place of special interest – plus one of the Kanto Regions largest open air markets (held on the day of the Hatsu-uma Festival, celebrated in Onabake according to the lunar calendar). The first “point of interest” is something that might only excite a trivia buff (like myself). Though this shrine is located in Onabake-machi, smack in the middle of Ushiku City, the address plate on its office reads Nareuma-machi, Ryugasaki City (which is the next city to the south)! 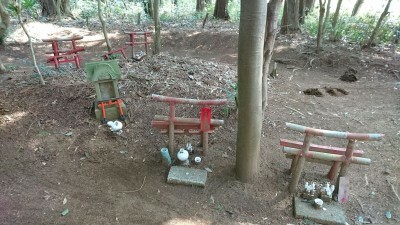 In other words, the Onabake Shrine is a TOBICHI (飛地), a difficult to translate Japanese term meaning: a part of a political unit (village, town, city, state, country…) that lies completely within another unit`s territory. 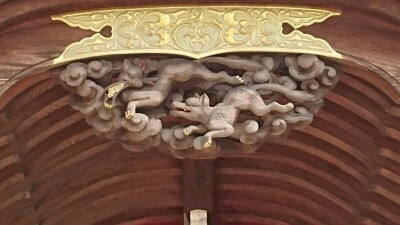 There are about 100 TOBICHI of a similar sort in Japan – and one more connected to Ibaraki Prefecture (apparently the Yuki Garden Hotel, located in Oyama, Tochigi Prefecture, has an address in Yuki, Ibaraki). 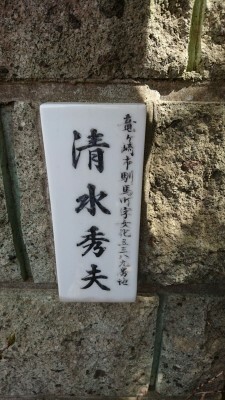 The reason the Onabake Shrine has such an unusual address is because of its history. Before the Meiji Restoration ( of 1868) and the movement to separate Buddhism from Shintoism (SHINBUTSU BUNRI) it promoted, this shrine was part of the Raigo-in Temple (来迎院) located several kilometers away in what is now Ryugasaki City. In other words, it was for centuries the patron shrine for the people of that area (in other words, the members (DANKA) of that temple are also parishioners (UJIKO) of the Onabake Shrine). 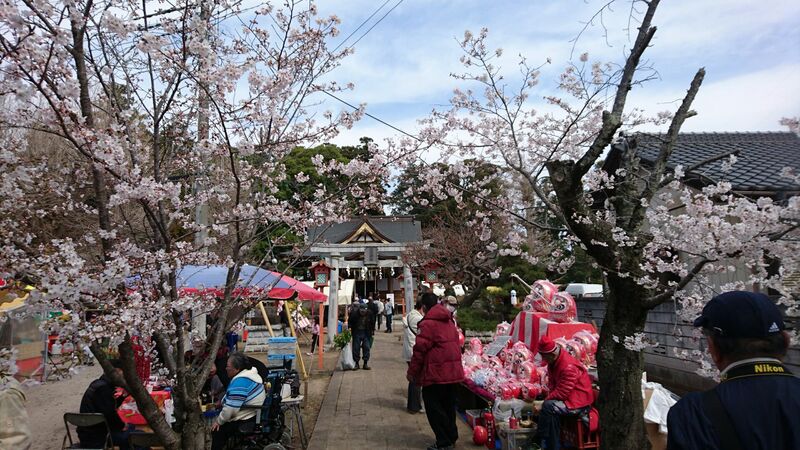 While the Onabake Shrine lies write in the heart of Ushiku City, its address is in neighboring Ryugasaki City! 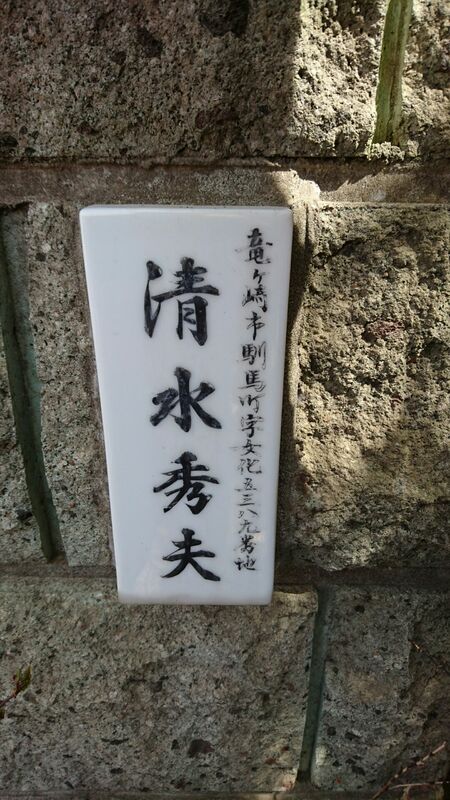 The name-plate on this house adjacent to the shrine grounds shows a Ryugasaki address! 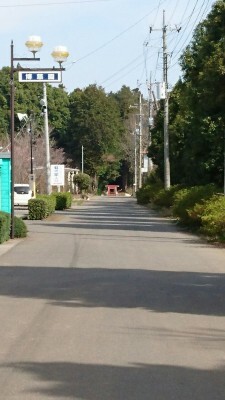 I guess it is because the area is an enclave of Ryugasaki within the city of Ushiku the surrounded area remains untouched by suburbanization. There once was a dutiful young man named Chugoro who lived in Nemoto Village. One day, as he was on his way home from Tsuchiura where he had been selling straw mats, he suddenly came upon a hunter, aiming his bow. The target, Chugoro saw, was a white fox, curled up and asleep. As a warning to the poor, unsuspecting critter, the young man gave out a loud cough, which awakened the fox and sent it sprinting off into the safety of the bush. Having his chance of bagging that beautiful fox foiled like that, enraged the hunter and he demanded compensation from the young man. All Chugoro could do to get out of the jam was hand over the little money he had made selling his straw mats in Tsuchiura. He arrived back home, where he lived alone, with empty pockets. Later that night, though, there was a knock at the door. When he opened it, he found a pretty young woman named Yae, and an older woman who was her servant. They told him that they were from Oshu, in the north-east, and had lost their way. They then asked if he would kindly let them stay the night. Chugoro aked them in. The next morning he found Yae all alone and crying. Her servant, she said, had run off, taking all the money they had had on them. Because she was penniless and all alone, Chugoro told her she could stay at his place for as long as she had to. Yae was kind, gentle and very beautiful . She was also a hard worker. Chugoro was extremely pleased (and felt very fortunate, as well) when she agreed to become his wife. They went on to have a daughter and two sons, and they all lived happily together – the envy of everyone in the village. But then one day eight years later, (in the year 1517, it is said), the older children were playing outside and Yae, nursing the youngest in the house, fell asleep. Later, when the kids came back from playing, she was still napping… and they noticed something strange – their mother had a big, bushy, white tail! 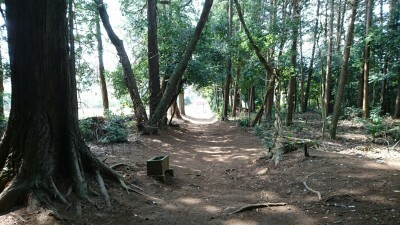 About 300 meters behind the Onabake Shrine`s main worship hall is this smaller shrine in the woods marking the spot where the fox that transformed into a woman is said to have had its den. “Mommy`s turned into a fox!” they screamed and ran back outside to get help. When Chugoro, heard the strange news, he rushed back to look for his wife – but she was nowhere to be found. He did discover a note, though, and it said: “If you should be asked where the baby’s mother is, say that she is out in the Onabake Fields, down on the ground and crying in sorrow!” (みどり子の母はと問わば女化の原に泣く泣く伏すと答えよ). And then suddenly, a white fox popped out of the hole. In their mother`s voice, it said: “Looking like this I can never go back home, but I will always watch over you! I will always protect you!” And with that, the white fox disappeared once again down the hole. 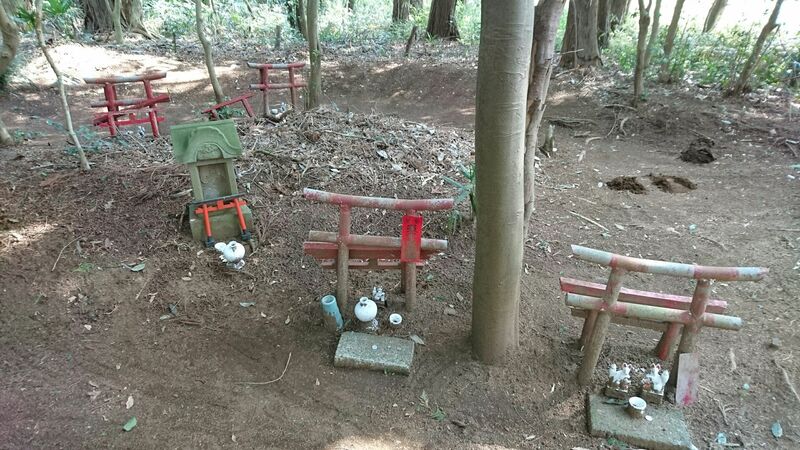 Later, the villagers erected a small shrine near the fox`s den, calling it the Onabake Inari Shrine. The fame of its powers grew as the three children Chugoro raised on his own became more and more successful, especially the youngest Takematsu, who went to work in the capitol, and whose son became a warrior with extraordinary good luck on the battlefield. 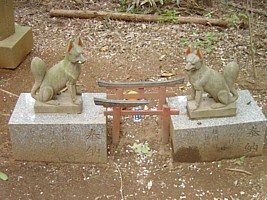 Small fox statues in the woods behind the Onabake Shrine near the site where the fox- who-had-returned- the-kindness-done-to- it, is said to have had its den. Besides being an interesting story typical of Buddhist tales promoting kindness to animals (by saying that the kindness given will be repaid with great reward, this story makes you think – which came first, an Inari Shrine in need of a creation myth, or a mysterious happening (such as the disappearance of beloved wife and mother of three) that led to various explainations (i.e. 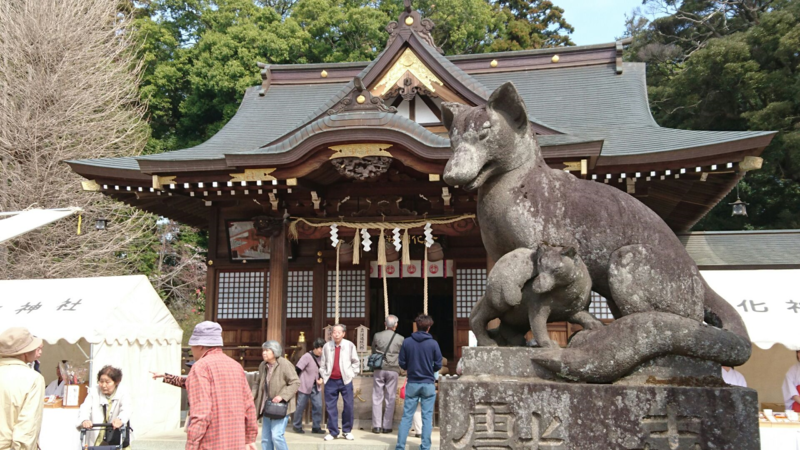 that she had really been a fox all along) that resulted in a shrine being built. Which came first? Who knows. 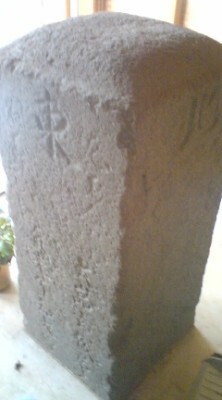 Despite rampamt development in Ushiku and Ryugasaki, Onabake remains mostly as it was fifty years ago. 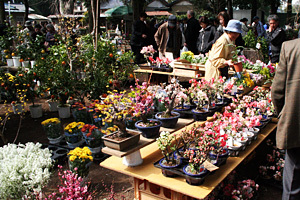 On the day of Hatsu-uma, the most important day of the year at Inari Shrine (celebrated at the Onabake Shrine according to the lunar calendar – on March 27th this year) a traditional outdoor market is held (one of the biggest such markets in the Kanto Region). 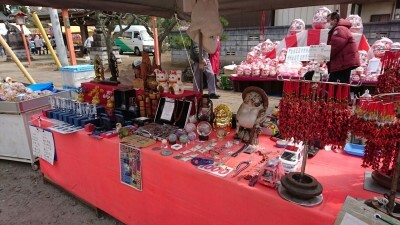 There should be about 200 different vendors selling potted plants, tree saplings, agricultural implements, clothing, ceramics, baskets, traditional medicines, amulets and other Buddhist and Shinto paraphernalia. Certain merchants based in the post-towns were able to make a good living off this continuous traffic. On the other hand, the peasants who watched the grand processions and merchandise pass by, never saw any improvements in their own lives, and at certain times, when in years of poor harvest (as was the case two years before the uprising) they starved by the thousand. I guess what happened back then is similar in way to what“s happening in the world today – the rich get richer and the poor get poorer. You see, the more man-power and horses the merchants in the post-towns had, the more money they could make. By ostensibly promoting a smoother flow of traffic they were able to get the Shogunate (through continuous lobbying and the greasing of palms) to impose a system of courvee labor on the peasants – and thus vastly increase their profits. No matter how busy the farmers were, or what time of the year it was, the peasants were forced to meet horse and man-power quotas that continued to grow (as profits increased). They tried to have their voices heard by submitting various petitions, but change dod not come – and eventually the situation became unbearable. And by unbearable I mean just that. It got to the point where, even though it meant an almost certain (horrible) death, the peasants who lived between Ushiku and Arakawaki decided that enough was enough. 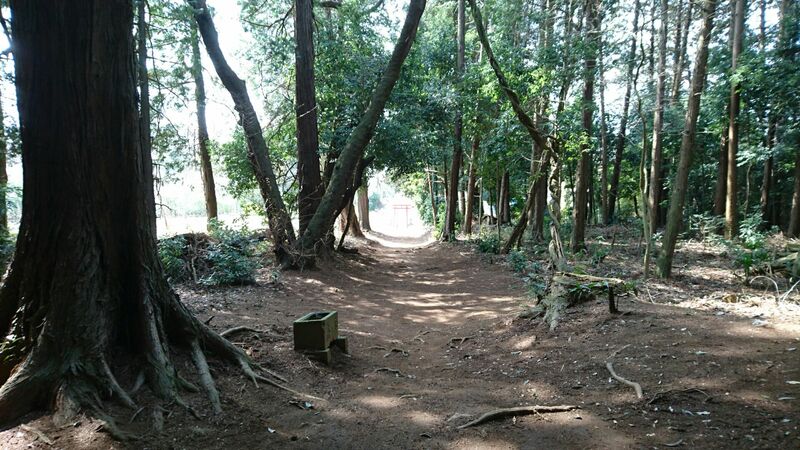 They held a secret meeting at a place that was very important to their hearts, a spiritual center of the area – the Onabake Shrine – and they decided then and there to raise up the flag of rebellion. 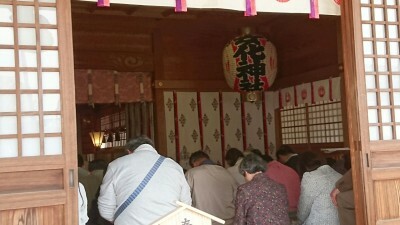 Before setting out, they prayed and made offerings to Inari-san, resolving themselves to their down their lives so that their villages could have a future. They had 6,000 men at Onabake from 55 villages (including some that are now within the Tsukuba City limits – Teshirogi, Kurakae and Hanamuro) and gathered more on their way towards the post-towns. The battle-cry of the day would be “Onabake!” shouted out for both for whipping up morale and for the magical protective powers the rebels thought the name would bestow upon them. They all wore straw hats and rain-coats and had ropes ties round their waist (straw armor for a peasant army) and carried bamboo spears and hoes. They also made banners of white paper which they hung bamboo poles. 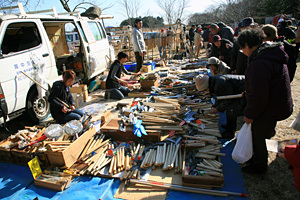 Over a three day period they destroyed the shops and homes of three important merchants in three different towns. the Shogunate called upon Samurai from the Sakura and Tsuchiura domains to suppress the rioters. Before there was any fighting, though, the peasants retreated to Onabake, where they gave up their arms and surrendered. Amazingly only the three top leaders of the rising were arrested and taken to the Denba Prison in Edo (now in Kodenba, Tokyo) where they died under torture. Seeing what extremes the SUKEGO courvee labor system had driven the peasants to, the Shogunate announced that instead of being permanent it would only be implemented for a further ten years. Ten years after the Meiji Restoration, in the year 1878, a former samurai from Wakayama moved to Onabake and set about developing with large scale Western-style agriculture. 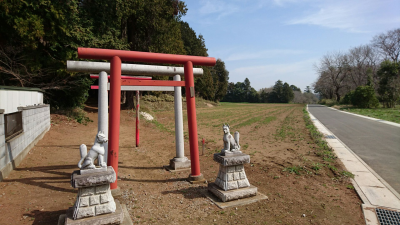 He was able to bring settlers in from all over Japan to grow wheat, barley and peanuts (for which the area is still famous for today – don`t forget to stop at one of Ushiku`s famous peanut stores when you visit Onabake!). 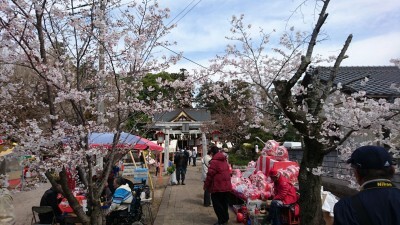 While Ushiku City and Ryugasaki have conitnued to develop as suburban bed-towns, Onabake has retained its rustic charm. 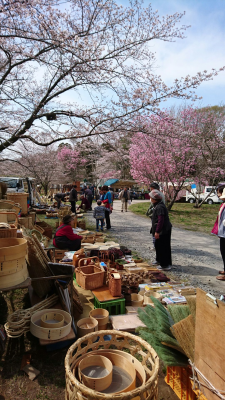 Just about the only excitement they have around there is the big outdoor market on Hatsu-Uma (according to the lunar calendar) and this year (2018) that will be on March 27th! Here is a map to help you get there. Thank’s God the Chance to meet you today! Praying the Reason for Justice and Freedom! I’ll be careful for every kind of error in my life and I’ll be lucky after 13 years excessive giving …to recover me just by learn more and be able to help! 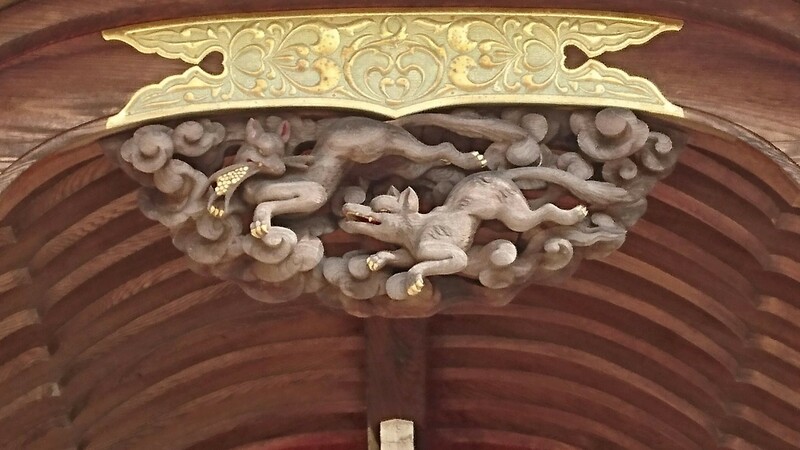 Thank you to be my Guide with TsukuBlog – it’s a precious Archive at least to read and recommend to friends before disappear like this ‘white fox’;)) Oups, I always enjoy the folk tales! You are great to wrote it, even with small err.) look in the legend to the firs image.